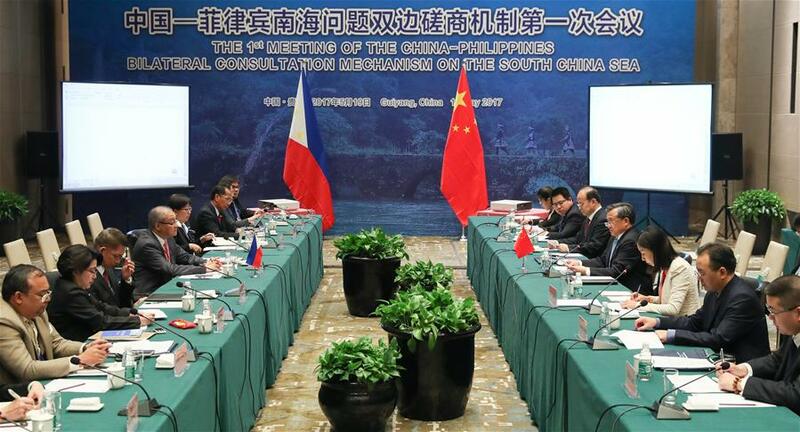 GUIYANG, May 19 (Xinhua) -- China and the Philippines Friday confirmed the establishment of a biannual bilateral consultation mechanism (BCM) on the South China Sea. The announcement was made in a joint press release issued after the first meeting of the China-Philippines BCM on the South China Sea. Under the BCM, officials from the respective foreign ministries and maritime affairs agencies will meet alternately in China and the Philippines once every six months. Consensus on setting up the BCM was reached at the diplomatic consultations between the two foreign ministries this January, the release said. During the just concluded first meeting, which was co-chaired by Chinese Vice Foreign Minister Liu Zhenmin and Philippine Ambassador to China Jose Sta. Romana, both sides reiterated their commitment to cooperate and to find ways forward to strengthen mutual trust and confidence. The two sides exchanged views on the importance of addressing concerns in the South China Sea and handling disputes there in an appropriate manner. Noting the South China sea issue has "returned to the positive trajectory" in bilateral relations, Romana said in his opening remarks that the Philippines is confident in the resilience of ties with China. Both sides reaffirmed the importance of maintaining and promoting peace and stability, freedom of navigation in and flight above the South China Sea, addressing their territorial and jurisdictional disputes by peaceful means, without resorting to the threat or use of force, through friendly consultations and negotiations by sovereign states directly concerned. China-Philippines relations have seen "a beautiful turn around," Liu told the press Thursday, adding that China highly appreciates the positive, friendly and constructive attitude adopted by the Duterte government. The significance of the meeting lies in the fact the Philippines has returned to the right track of bilateral consultation and managing differences properly with China, Liu said. It shows the Philippines' agreement on adherence to the China-championed "dual-track" approach, which calls for disputes to be resolved peacefully through negotiation between directly concerned parties, and for China and ASEAN members to work together to maintain peace and stability in the South China Sea, said Wu Shicun, president of the National Institute for South China Sea Studies. The two countries are telling the international community that they are capable of handling issues of common concern without a third party's interference, Wu stressed. The success of the first BCM meeting represents an important signal that China and the Philippines are jointly moving toward an early conclusion on the Code of Conduct (COC) in the South China Sea, Wu said, while adding that further efforts are needed from all parties on the issue. The two sides held discussions on issues including the promotion of next-step practical maritime cooperation and the possible establishment of technical working groups. Liu said China hoped there would be some joint development in gas and oil before maritime disputes are ultimately solved. According to the press release, the second meeting of the BCM will be held in the Philippines in the second half of this year. "The word mechanism demonstrates the bilateral consultation will be institutionalized rather than just a once-off thing," Liu said.